C-Train is the light rail network serving the Calgary city in Alberta province, Canada. It is the busiest light rail systems of North America. Every day, it carries around 333, 800 passengers. 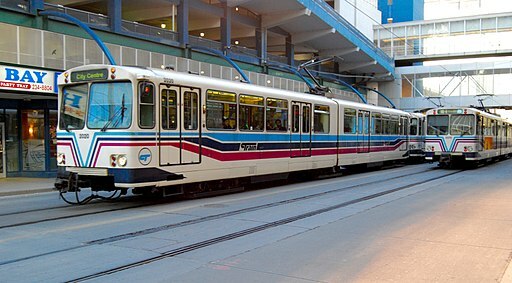 It is the most convenient public transit system for people who work in Downtown Calgary. Calgary C-Train system currently consists of two lines and 45 stations. Total track length is nearly 60 km. Calgary Transit, a mass transit service provider owned by the City of Calgary is given the responsibility to operate the system. It is the first mass transport system in Canada that uses electricity generated solely from wind power. Calgary is an important as well as an overcrowded city of Canada. Regular road transport didn’t have the capacity to carry all of the people who commute to the downtown area every day. Again, in the downtown area, it was increasingly problematic to provide parking lots to the growing number of cars. This called for an alternative high capacity transport system. It was 1967 when a two-line metro system was first conceived. However, after the 1970 building boom, the city authority decided to go for a light rail instead of a metro system. The construction of the first line, the south line, began in June 1977. It started revenue service on May 25, 1981. Next opened the Northeast line on April 27, 1985. The Northwest line started operation on Sep 17, 1987. The West line is operational since December 10, 2012. All of these lines were extended later on to achieve their current lengths. Trains of C-Train network run from 4 AM till 1 AM every day. The timing may slightly vary depending on the particular line and route. The headway is 10 minutes. Get the timetable of C-Train here. The two lines are respectively called Route 201 – Red Line and Route 202 – Blue Line. The routes are mostly differentiated except for a 2 km long section near the downtown area, called downtown transit mall. Towards the south of the city C-Train and Canadian Pacific Railway share the route and it is possible to switch between the two networks. The routes are partly underground, partly elevated. The stations were originally built for 3-car trains. Currently, 4-car LRT trains are being introduced in the system in a phase wise manner. It connects the northwestern and southern parts of the city. It is a 33 km long line and has 20 stations along it. The line has two legs, namely, the Northwest leg and the South leg joined by the downtown transit mall. It connects the Northeastern and Western parts of the city. It also has two legs joined by the downtown transit mall. This route is 25.7 km long and has 16 stations along it. Some of the stations on this route are: Saddletowne, McKnight–Westwinds, Marlborough, Zoo, City Hall, 8th Street, Downtown West – Kerby, Sirocco, 69th St. SW. The system is being constantly expanded. The 201 Route may be extended another 3.5 km to 210 Avenue SW station. The 202 Route may be further extended to connect to Calgary International Airport. Route 203 – Green Line is in the planning phase. The exact route is not yet finalized but it should cross the downtown transit mall perpendicularly and should have a north central and a southeast leg. New tunnels are being constructed as a result of rapid expansion of the system. In view of city’s growing population and increased traffic congestion, new routes and extensions of current routes are mostly going to be underground. The fare calculation of C-Train is similar to all other Calgary Transit operated modes of transport. Rides within the downtown area are free. It is called the 7th Avenue Fare Free Zone. For all other parts of the city, you can either purchase a single ticket or a booklet of 10 tickets. A single ticket for an adult costs $3.15 and for a minor costs $2.10. Children aged 5 or below travel free of cost. High-school students with ID card also get the same discount as the minors. There are also passes available. Passes are of two types: Day pass and Monthly pass. Day pass for an adult costs $ 9.50 and for a minor costs $ 6.75. A monthly pass costs $ 99 and $ 65 respectively. Besides, special passes are there for travelling to and from the Calgary International Airport, for senior citizens and pet animals. Tickets can be purchased either from ticket vending machines or online from company’s website. Get detail information on the fare system here. Following are the services that Calgary Transit makes available to you. To maintain safety and security, the system uses IP based cameras. The stations have Park and Ride lots. The stations also have bike racks and bike lockers. The stations and the trains are all equipped with multiple HELP devices. These include phones, Intercom system, buttons etc. Before using the service, know about C-Train rules. Pets are allowed on the trains only under certain restrictions. Smoking is prohibited on the trains and a violation of this rule may cause monetary punishment. Following tips may help you organize your journey better. Use the trip planner to plan your trip in advance. You can register your e-mail in C-Train’s database and turn on the e-mail alerts. Then you’ll get information on any cancellation or route change automatically. If you need to transfer to a Calgary Transit bus from C-Train, pay the transfer fare to the bus driver and complete the transfer within 90 minutes.